I’m a political junkie, I have been since I was a little boy. I understand political maneuvering, spinning stories, manufacturing rage and dodging PR nightmares. Anyone who has been in this field for more than half an hour knows politics is a blood sport. Today however, my rage is not partisan, it’s personal. The government shutdown is a political issue, a partisan debate and a sensationalist media’s dream come true. It is not a tool for punishing innocent bystanders in the political arena, but that’s how it's being used by President Obama. The Federal Government has denied death benefits to the families of our fallen soldiers. Meanwhile PBS continues to receive funding, the White House bowling alley apparently remains operational, the golf course at Camp David is on par, and the National Mall was opened for an immigration rally. It’s a rare day that I allow politics to genuinely impact my emotional well-being, but today I cried. I cried not as a policy wonk, a blogger, or an activist, but as a citizen and as a veteran. I cried for those fallen heroes who were sent into battle by President Obama and who were slain for our country believing that they and their families would be taken care of. As Commander in Chief of the Armed Forces our President has an obligation to our dead warriors. He is not above the military’s time honored tradition and value of never leaving a man behind. Denying the families of fallen warriors the privilege of flying to Dover Air Force Base to greet their loved ones for the last time is an absolute disgrace. 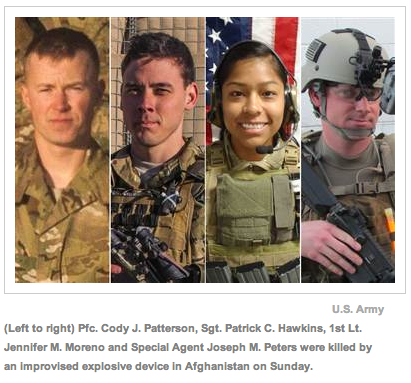 Denying the wives and children of those fallen soldiers’ death benefits is reprehensible. Fear not though America, PBS is still on the air, the First Lady can still bowl, and the President can still golf. President Obama and his progressive foot soldiers in the media are hypocrites. They claim the government shutdown is a result of GOP heartlessness, meanwhile Air Force One sat ready on the runway, willing and able to go pick up the families of our slain heroes who were denied the honor and tradition of greeting their dead. In Barack Obama’s America Big Bird's air time is more important than dead soldiers, yet apparently it’s the Republicans who have no heart. This isn’t the first time our President has used our dead heroes as his personal political pawns, and thanks to the unscrupulousness of the American media, it probably won’t be his last. I can tolerate, and even understand cold hearted political maneuvers, but America’s dead warriors, and their families, should be cherished, never used and abused for political vindication or cheap press. Never in my life have I been more disgusted with my government. We have hit a new low as a society if we turn a blind eye to the callousness of our elected officials treating the sacrifices of its warriors as trivial. Now is the time to rise up as citizens, and as a movement, to demand that this administration place the needs and will of the American people above its seemingly unquenchable thirst for political vengeance. Integrity, honor, and courage don't require government appropriations. First and formost Shane: Fantastic first rate post! I doubt you're in any kind of minority on this issue!! I commend your ability to prevent politics from gigging you emotionally. For my part, I'm getting better at it, then along comes krap like this, as if what's happening to America wasn't allready enough to bear; and I'm back to square one. One thing I do hold in my heart (or this stuff would have long since made me looney! ), is that someday, by some means, be it the hand of their fellow man, karmaic justice or ultimate judgment we all will face someday; These people will be made to answer for their actions (...or inactions). There WILL be a reckoning. I share your hurt, anger and disgust with the president and his abhorrent misuse of his power and total disregard for our brave military and the American people. He is destroying our country and this breaks my heart. These are very sad times for our beloved country! Doris “Dorie” Miller was a Mess Attendant working on the USS West Virginia. Like most mornings, he rose before dawn for a dreary day of hauling trash, scrubbing dishes and prepping food for the battleship’s cook. While collecting the crew’s laundry, the General Quarters alarm sounded. Ships have drills all the time — even on Sunday mornings — but a sailor still must answer the call. President Poutypants is really revealing his petulant side. The government has shut down several times before now, but this president has been so spiteful as to close down outdoor monuments and even privately-funded sites that have never been shut down before. Now, his foot-stomping has sunk to a whole new low. It’s as if current events are working together to reform education, or, at the very least, to make it evident to all Americans why reform needs to happen. Between the current government shutdown and the looming debt ceiling, it’s becoming more evident every day that the safest place for education is as far away from the federal government as possible. The federal government is now into its second day of being shut down, which means different things for different people. For the average American, not much is going to change. However, there is one governmental department which touches many (too many, some would argue) lives: The Department of Education. The question is will a government shutdown really make a difference to the majority of American families who have school age children?